The Paasche D200T Quick Application Tanning Set including the D220R Compressor will be a perfect fit for easy home and high volume salon applications. In order to achieve this, the manufacturer has completed the set with the 300T-000 manual spray gun and 32 oz. of 10% gold tanning solution. First off, there’s a couple of things to say about the company itself. For the 114 years of history, Paasche Airbrush Company has achieved extraordinary success. Nowadays it is the leader in the market of the airbrush industry. And no wonder, because company skilled professionals constantly work on the development and improvement of their technologies and products. 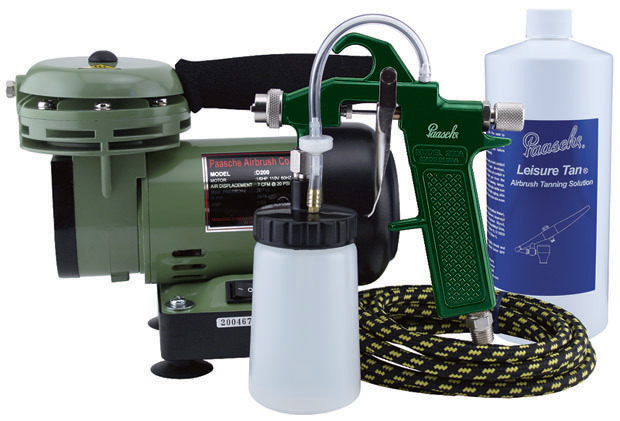 It is for this very reason, Paasche has become known throughout the world for the perfect quality of their compressors, paints, and airbrushes. Just put everything together and you’re ready to spray. 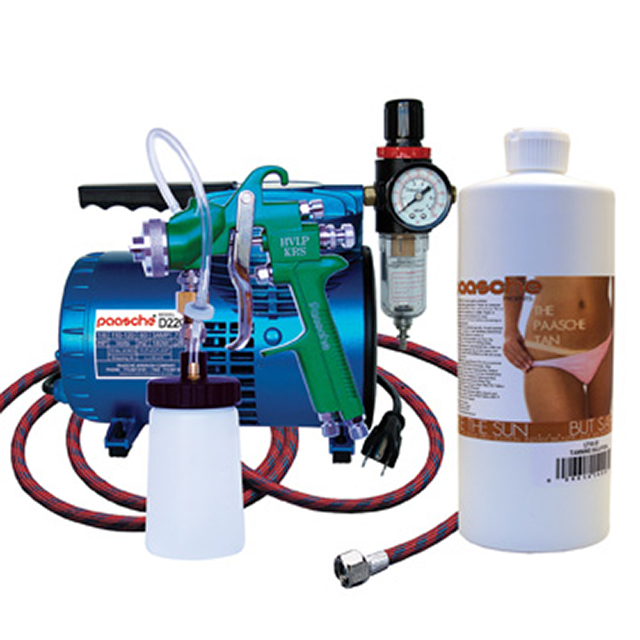 For the record, this airbrush tanning kit is extremely easy to assemble, clean, and maintain. To do so, follow the instructions in the user manual. For one thing, this airbrush tanning kit offers pretty high speed and exceptional quality of tanning solution application. One of the main benefits of D200T is its fine spray pattern which is from 4 to 5 inches wide. This allows for quick application, up to 5 minutes only. For another thing, the D220R air compressor from this set is silent enough to provide not only a perfect tan skin coloring but also a comfortable silent running operation. With this Quick Application Tanning set, it’s easy to forget about how much sunburn can pain and how long you need to patiently wait for a beautiful tan under the sun. Also, this airbrush tanning kit will be a good value for money. And in case, any difficulties with the kit appear, you can always turn to the manufacturer for assistance.